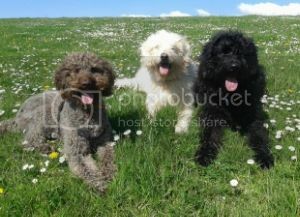 UK Labradoodle Association • View topic - Foster home needed for 2 doodles for a few months. Foster home needed for 2 doodles for a few months. Post subject: Foster home needed for 2 doodles for a few months. Hi. This is my first post here and I do so with a heavy heart. Last week my wife was diagnosed with cancer which has been an absolute bombshell, as you can imagine. We don't know the extent of it yet, but one thing is certain; she'll be having chemotherapy and radiotherapy for a number of weeks starting (probably) in mid-November, and it might involve surgery. We have two Labradoodles, male, aged 4 and 16 months respectively who we love so much but it's going to be difficult giving them anything like the time and exercise they currently enjoy as all my time is going to be devoted to my wife (and I also work full-time, although will be taking time off to attend hospital (90 minute round trip) etc). The ideal scenario for us would be for the dogs to be off our hands for a couple of months to concentrate on my wife, and we want to avoid kennels if possible. They would have to go together. I know it's a long shot, but I've got to ask. Can anyone help, or give advice on who might? They are fantastic dogs who brighten up our lives considerably. Post subject: Re: Foster home needed for 2 doodles for a few months. Mike, so sorry to read the bombshell news of your wife's diagnosis.It is a long road to travel.Cancer touches so many of us or those close to us these days. Commend you for thinking of the doods welfare at this time. Validate your options but may well be having the doods around shall be great comfort to you both on tough, rainy days. Dogs are oh so adaptable too. Could be an occassional dogwalker may suffice. Neighbours to help out. The Cinnamon Trust, volunteer run, i think will offer walks etc usually for elderly folks but also whilst folks are very ill/ in hospital. If you do go for foster home option do consider paper work to make clear is foster and not rehoming. I too am sorry to read about your wife's diagnosis. Like Pollydoodle says, it is something that touches most of us one way or another. While you'll want to do all you can to support your wife, and see to the welfare of your doodles, maybe don't make decisions too quickly - the diagnosis is a shock, and maybe take a little time to consider options. In the meantime, I too think the Cinnamon Trust might help. Also, if you could post your approximate whereabouts, eg just a county, then there might be people nearby who would offer to foster, or to provide a load of support - walking, daycare, sleepovers, etc - if that might work better for you and doodles. I'd also contact the Doodle Trust to ask if they'd advise you on paperwork (as suggested) and what to check in potential fosterers - genuine people would be glad to be checked out. I do hope that your wife receive a positive outlook when she finds out a little more. All the very best to you, your wife and your doodles. Such a sad post My thoughts are with you and your wife and sending healing thoughts. My house is full or I would have offered to help. I agree with the others.... try contacting Barb at the Doodle trust , I'm sure she will offer the best of advice on how to proceed with finding suitable foster care. As said it might help if you posted your area. so that folk in your area can offer help if they are able to offer a place for your boys..
Do post again if you find the help you so desperatley seek. Where are you based Mike? So sad Mike - please tell us whereabouts you are - there will be some kindhearted person willing to help you out I am sure, and Ei is right - you and your wife may find you need and appreciate the love and support that a dog can bring - even the need to get out and exercise them can bring a little peace into your life. I am so sorry to hear about your bad news .I wish I could help you but having two Doodles of my own it is very difficult. I must agree if you could arrange someone to help so that maybe you could keep the dogs in their own home it may help with the recoverey, As am sure that you will miss them very much. As they will you. Good luck and I do hope everything works out for you and your wife as I'm sure it will. Please keep us posted. We're based in the Vale of Glamorgan, west of Barry. The treatment starts on 28th November, for 5.5 weeks, so will overlap Christmas. Thankfully, it hasn't spread elsewhere so there's a good chance of full recovery, but it's going to be a hard winter. Whilst it would be a help not having the dogs around, we'll keep them here. The chances are they'll not get so many walks as they are used to, and there'll be times when they're left alone for a little longer than normal, but at least they'll not have the stress of being away. One of them in particular (our brown doodle) is a real couch potato and will be a great source of comfort I'm sure. The black (grey now) one is more athletic and wants to play all the time - he'll have to chill for a few weeks. I'll think about contacting Barb. As we don't know the times yet of the treatment it's hard to gauge when we could do with extra help, but we'll get through it somehow. Many thanks for your kind words and support, and I'll keep you updated. Please P.M Mike if you can help in any way. Mike you might also contact doodle owners on Facebook to see if you can get help with walking the doods.